1 of 6 Heat oven to 350 degrees F. Line two 12-cup (2-3/4 x 1-1/2 inches) muffin pans with Halloween paper cupcake liners. 2 of 6 Sift together flour, baking soda, cinnamon, ginger, nutmeg and salt into a bowl. 3 of 6 Beat together sugar and butter at medium speed in large bowl until smooth. Beat in eggs, one at a time, beating well after each addition. Beat in pumpkin. (Mixture may look a little curdled). 4 of 6 On low speed, beat in flour mixture just until blended. Stir in pecans by hand. 5 of 6 Fill each cup-cake liner with about 1/3 cup batter. 6 of 6 Bake in 350 degrees F oven for 30 to 35 minutes or until wooden pick inserted into center of cupcakes comes out clean. Remove cupcakes from pan to wire rack to cool completely. 1 of 2 Beat together cream cheese and butter at medium speed in large bowl until smooth. Beat in orange juice concentrate and extract. On low speed, gradually beat in confectioners' sugar until smooth and well blended. 2 of 2 Frost each cooled cupcake with about 2 tablespoons frosting. 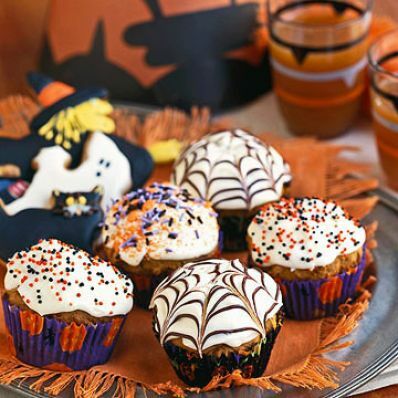 Decorate half of cupcakes with Halloween sprinkles. Decorate remainder with "cobwebs." Makes 24 cupcakes. 1 of 1 Place 2 ounces semisweet chocolate pieces, coarsely chopped, in small metal bowl and place over saucepan of simmering water. Stir chocolate until smooth. (Or melt chocolate in microwave-safe bowl, uncovered, in microwave oven on high power for 50 to 60 seconds.) Spoon melted chocolate into plastic food-storage bag; press out all the air and seal. Cut off very small piece from one corner to make about 1/16-inch hole. Starting in center of each cupcake, draw spiral with chocolate. Using tip of paring knife or wooden pick, draw 6 to 8 lines from middle of each cupcake to edge, making cobweb pattern. Per Serving: 196 mg sodium, 2 g fiber, 414 kcal cal., 5 g pro., 53 g carb., 196 g sat. fat, 21 g Fat, total, 74 mg chol.